Family Weekend is excited to celebrate 100 years of a weekend dedicated to Aggie Families! Join us for a weekend full of fun and celebration. The Family Weekend schedule is also available on the TAMU Mobile App for both Android and iPhone. Thousands of excited Aggies will receive their Aggie Rings. Activities include: The Career Center polishing Aggie Rings; Benjamin Knox ‘90 signing prints; free samples from Slovacek’s Sausage; the MSC Book Store selling official Aggie Ring Day T-shirts; and many photo opportunities including Bus 12 and the Spirit of ‘02 Cannon. Click here for more information. Have questions about Family Weekend? Need directions to an event on campus? Visit the Family Weekend Information Desk, hosted by the Aggie Family Ambassadors, to receive information and updates on Family Weekend events. Visit Aggie Park, located between University Center Garage and the Clayton Williams Alumni Center, to receive complimentary family photos with our oversized “FAMILY” letters, grab a bottle of water, and enjoy the sights of Aggieland! This event is hosted by the Aggie Family Ambassadors and will take place during both Aggie Ring delivery days. Aggie Gift and Craft Fair presented by the Aggie Moms’ Clubs. Join us for a free, family-friendly tailgate prior to the Maroon & White Spring Football game. The tailgate will include food, games, and more! Aggie Sober Tailgate provides a fun, celebratory space on game days without alcohol. All are welcome to this free event – Aggie Sober Tailgate is an opportunity for current students, future students, alumni, faculty/staff and community members to connect with each other and raise awareness of recovery services on campus. Join us on the Rec Sports balcony and Room 2225 for the TAMU vs. Auburn baseball game (game starts at 6:30 p.m.). Admission to the 2019 Maroon & White Game is free. Click here for more information. MSC Variety show offers Texas A&M students the opportunity to showcase their unique talents to the masses. Join us on April 12th at 8:00pm to cast your vote for the most talented student to receive a $500.00 grand prize, and witness the judge winner receive a $1,000.00 grand prize for mastering the evening. You don’t want to miss out on this rare opportunity to experience the many gifts and skills of our student body. Free with valid TAMU student ID. $5 for non-TAMU students. Tickets available at the MSC Box Office online or in person. Study Abroad Programs Office sponsors a breakfast each year designed to provide students and families with the opportunity to speak with advising staff during breakfast then view a presentation and hear from a student panel. Breakfast will be served from 8:00 to 9:00 a.m. RSVP: tx.ag/FamilyBreakfast2019 by Friday, April 5th . Join Kappa Alpha Theta for the 33rd Annual Rock the Casa 5K and Silent Auction! All proceeds benefit: CASA – Voices for Children, Scotty’s House, and Theta Foundation. Register for the 5k here. The annual LAUNCH Family Weekend Brunch helps build community and celebrate success of students, faculty and staff. The informal program includes student entertainment, student recognition, and the opportunity to visit with other students in the program. Families of Mays Business School and Texas A&M University are invited to attend an open house in the Wehner lobby. Come explore what Mays Business School has to offer and join us for a keynote speaker at 10:00 AM. Breakfast beverages and refreshments will be provided. The Vice President’s Residence will be open to campus visitors. Light refreshments will be served. Stop by the beautiful Cushing Memorial Library and Archives and view our unique collections! On display: on the first floor, items from the University Archives, including a student exhibition on Texas A&M cooperative housing; on the second floor, our new main exhibition, The Stars Are Ours: Infinite Diversities in Science Fiction and Fantasy. The Street & Art Fair will feature artists and artisans from across Texas demonstrating and selling artwork. Drawings, paintings, jewelry, pottery, glass and metal art create an eclectic mix of offerings seldom seen in one exhibition. Live music will be played throughout the day. The MSC Annual Award ceremony exists to recognize the 1400 students and 200 programs they planned this year in the MSC. We invite all to come to help us celebrate the hard work these students have put into their committees this year. A small array of refreshments will be provided at the reception and the event is free to all who would like to attend. ¡Un Fin de Semana con Su Aggie! Join the Hispanic Presidents’ Council in Un Fin de Semana con su Aggie!, a chance for the Hispanic/Latinx community to introduce their parents to the environment we have found in Aggieland and to celebrate the Hispanic / Latinx familia with light refreshments, a bi-lingual panel of current and past Aggies, and Lotería. We hope to see you there! Fish Camp 2019 is excited to host its annual Fish Camp Banquet. This will be a time for former participants and all guests to see what Fish Camp’s staff has been working towards to send more freshmen to camp. A BBQ dinner will be provided, and guests will have the opportunity to bid on items through our Silent Auction. Tickets are $30 per person and are available for purchase on a first come-first serve basis at https://bit.ly/2WbEDy6 . Freudian Slip Improvisation Comedy Troupe is putting on a Family Weekend-themed Improv Show! Tickets are $5 at the MSC Box Office. 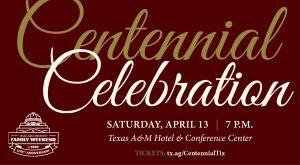 The Family Weekend Centennial Celebration is an exclusive opportunity to commemorate 100 years of a weekend dedicated to honoring Aggie Families. This special event will reminisce on a century of Family Weekend and look toward the future of this revered Aggie tradition. You’ll get to view our curated display of Family Weekend artifacts and memories, take photos in the photobooth, hear from special guest speakers, enjoy music from a live band, and indulge in dessert and a cash bar. Everyone is welcome, but tickets are required for all attendees. Purchase tickets here. The Buck Weirus Spirit Award recognizes students who make contributions to the university through participation in student organizations, Aggie traditions and university events. The ceremony is an opportunity to celebrate the award recipients’ achievements with their friends, family, and the Aggie Network. Students receiving this award have received prior notification. Join CARPOOL and the Aggie Wranglers for their Annual Family Weekend Crawfish Boil. Find out more information about the event and purchase tickets here. The Texas A&M Chapter of Project Sunshine is a non-denominational, non-profit organization that provides free programs and events to children and their families in Bryan/College Station with long term illnesses, disabilities, and special needs. Join Project Sunshine for their fundraising fashion show. The kids will be “rocking the runway” in their favorite attire. There will be a variety of snacks, outdoor games, and a silent auction from a variety of restaurants and businesses that you do not want to miss! Tickets are $10 and can be purchased at the door or online. The Corps of Cadets honors those units which excelled as a result of their skill, discipline, and teamwork during the year. Following the Unit Awards, the Corps of Cadets will conduct a pass in review. Events with a cost/tickets associated with it are denoted by a $.